Bad Hebrew Tattoos: Strength? You'll Need It! It's not really unlike English. If you write an English sentence vertically it would be equally as stupid to write it from the bottom to the top. Plus the "noon" looks like a Z which makes no sense whatsoever. what is correct way of writing "daniel" in hebrew? can someone tell me how to write brothers forever in hebrew horizontally if it is posible at all. And can you post it so I can see how to do it propertly if possible. Thank you..
Hello, please help me. My wife and I wish to get the Hebrew word for TEN or TENTH tattooed for our 10th wedding anniversary. Please could you confirm the correct spellings? Thanks so much. Which one for Ten do you think is most appropriate? Did you mean that עשרה is only used when counting? My name is Brenda. I want to get a tattoo with the names of my 4 children in Hebrew. I've gone on many sites and got various different translations and I am very confused. If you could help me out and translate my babies names for me I would really appreciate it... The last thing i want is gibberish on me... The names and year of births are: Brian (2004), Angel (2006), Rihanna (2010), Adrian (Due in September, 2011). Thanking you in advance, Please help. The letter Yod (י) is used when counting, as it's the tenth letter. The other versions are used depending on Ten of what we're talking about. עשר is the most neutral. Aww how disappointing I can’t imagine how frustrating it must be for a tattoo translation to go wrong after you have even gone to the trouble of consulting someone to check it’s correct. This is why consulting a professional in a translation company is really the most ideal solution. Real language professionals would only ever make accurate recommendations and prevent error that will last you al lifetime like these from occurring. I would love to get El Shaddai in hebrew as a tattoo but im deathly scared of getting some backwards crap. Could you help me? Its my first tattoo & im really nervous. Former tattooist here. I forget how many times I said, "That's *not* what you think it says." The worst part is, some clients didn't believe me. They went to someone else and got whichever bit of gibberish inked in. One guy said to me, "But I like the way it looks. The way you spell it doesn't look as cool." I bet that Bibi would be overjoyed. "celebrating our 10th wedding anniversary"
How do you pronounce "Lord Give Strength" can you write it Phonetically? I know there are many versions in hebrew of the word "strength" - do you know the one meaning courage/strength? How do you know when to use tet or tav(or any other of those similar letters like samech and sin or kuf and caf or even ayin and alef. and the vowels too because I know there's like at least 3 ways to make the oo sound and at least three to make the ah sound and even more ways to make the eh sound)? Sometimes my friends ask me to write out their names in Hebrew and I write it out the way I think it is, but I'm almost positive that if they were to get a tattoo of what I write down as their name in Hebrew, they would appear on this site.Could you give some pointers maybe in the next post? to transliterate a hard T sound like in Tim you would use a Tet (ט) for the 'softer' Th sound you would use a Taf (ת) with an apostrophe ' on the left side of the letter. For any S sound in English you would transliterate to samech (ס). The sin (ש), which is identical to shin, would be used for Sh. This is only for transliterating names or words that are entirely foreign to Hebrew. Sara, for example, which is a Hebrew name and comes from the bible, is written with a Sin, just because that's the traditional way. So, to be safe you really should check any name specifically, especially is you think the name might have an actual Hebrew parallel. Kuf (ק) should be used for K. I can't, at the moment, think of any use of Caf (כ) that's appropriate for transliteration. Ayin (ע), though it is pronounced in modern hebrew similar to Aleph, is traditional a gutteral sound which doesn't have a real parallel in English or any European language, so it wouldn't really be used in any transliteration. Vowels, in general are tricky. Again, it would be better to consult depending on the specific name. Names can be written anyway one wants technically, but there are some "standard" ways to transliterate certain names to Hebrew. More like conventions, less like rules of when to use ט or ת etc. Best ask an Israeli with good Hebrew spelling (not all Israelis can spell Hebrew well, like not all Americans can spell English well). I'm trying to get "my god, my father" tattooed on my forearm vertically. My friend's wife studied Hebrew and was gonna write it out for me but that never happened. Could someone please write it out vertically so I don't end up as another victim. :) thanks. Or exetly like in english. I really would like to get a bible phrase written in Hebrew and I'm so confused! Please help!! "Though my mother and father may forsake me, the Lord will hold me close." "כי אבי ואמי עזבוני ואדוני יאספני"
Im pretty sure that this is the phrase youre talkin about..
we read hebrew from right to left so don't get confused. I would like.to.get strength of God ..or.. child of.God and I was wondering what the Hebrew spelling was for those. Can anybody translate my name : Ingrid .?? It's not Jewish so isit possible ?? About the meaning- I found on the internet :"Ingrid is a German girl name. The meaning of the name is `Beautiful Mythical Fertility god`. but it dosn't sounds right. Of course it's possible, everything can be translated into hebrew. Everything depends on the font, it can be a lot more beautiful in a biblical font. I want to get the word for strength tattooed, but I'm not sure what kind of strength to get. I know there are like three different words for strength.. I want the one that means to be strong, and have the strength to get through anything. your name can be transliterated,not translated (unless you tell me what does Ingrid mean). it'll be אינגריד. but that sounds more natural to me, as an Israeli. How would I write "one eternal round"
I want to get Faith Trust Prayer in Hebrew vertically so I was wondering how that would be written. So could someone help me out, thank you ! Hello, I am supposed to be getting hebrew tattoo next week! "Loved" I am not sure that I translated it correctly! I was wondering if you could help me out? If people consulted a company and got a professional translation service then things like this wouldn't happen! Can someone tell me how to write God is my strength (referencing 2 Samuel 22:33) in hebrew vertically? Hi,help me please. 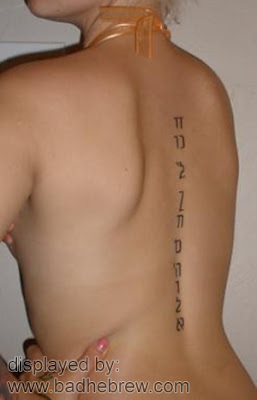 I would like to get tattoo that says: all in my heart forever, vertically in hebrew. How will this be correct please ? Hi! I would like to give my firstborn son the Hebrew word for strength as his middle name. There were a lot of translations, one was toqeph. The phonetic pronunciation was cited as to'-kef. Is this correct?? I'm looking for a translation that fits the context of strength, power, might. Is the English spelling correct?? Any tips or advice would be greatly appreciated!!! We want his middle name to be just as special as the first! To-kef is someone that attack you. You can also say ko-ah -> כֹּחַ but its more like power then strength. Hi could you tell me what "rejoice" in Hebrew is? Thanks! Whats 'forever yours' in hebrew? Can someone please tell me how to write strength, courage, and wisdom? It is not correct translatet, this way it means "Give all you have to make Love"
as a Prayer: "מי יתן וכל מעשיך ייעשו באהבה"
Apptopriately as a spine Tattoo...can it be broken up? I would like to heave Fear Not, and flower design, and God is wih you , at the oher end of he flower? Thank you! "God is with you" - "אלוהים איתך" or "אלוהים עמך"
I would prefer "אלוהים עמך", it is more Biblical. On the other hand, it can be read as "your people"
Could you tell me how to write "stay strong" I want to get it tattooed today! so I guess it is like " i will stay strong " ? but I`d write "היי חזקה" which means "be strong"
Thank you very much, היי חזקה it will be then ! What is the full sentence, What is the exact meaning you are looking for? Hello, I would like a tattoo in remembrance of my late jewish husband, it's the poem "We remember them"
Can someone please tell me if this is correct? I so appreciate it! בשמש העולה וביורדתה; אנחנו זוכרים אותם. בהתנשפות הרוח ובצינת החורף; אנחנו זוכרים אותם. בפתיחת הניצנים ובתחיית האביב; אנחנו זוכרים אותם. בשמשות החמים ובחמימות הקיץ; אנחנו זוכרים אותם. ברשרוש העלים וביופיו של הסתיו; אנחנו זוכרים אותם. בתחילת השנה וכאשר היא מסתיימת; אנחנו זוכרים אותם. כל עוד אנחנו חיים, גם הם יחיו, כי הם עכשיו חלק מאיתנו כמו שאנחנו זוכרים אותם. כאשר אנו עייפים וזקוקים לכוח; אנחנו זוכרים אותם. כאשר אנו אבודים וחולים בלב; אנחנו זוכרים אותם. כאשר יש לנו החלטות שקשה לעשות; אנחנו זוכרים אותם. כאשר יש לנו שמחה אנחנו משתוקקים לחלוק; אנחנו זוכרים אותם. כאשר יש לנו הישגים המבוססים על שלהם; אנחנו זוכרים אותם. כל עוד אנחנו חיים, גם הם יחיו, כי הם עכשיו חלק מאיתנו כמו, אנחנו זוכרים אותם. Also, his Hebrew name was Gedaliah, is this the correct spelling? Hello, do you the "We remember them" poem in hebrew? Thanks!